For centuries, the locket— a pendant that opens to contain a portrait, a lock of hair, or a tiny love letter—has been a classic accessory. 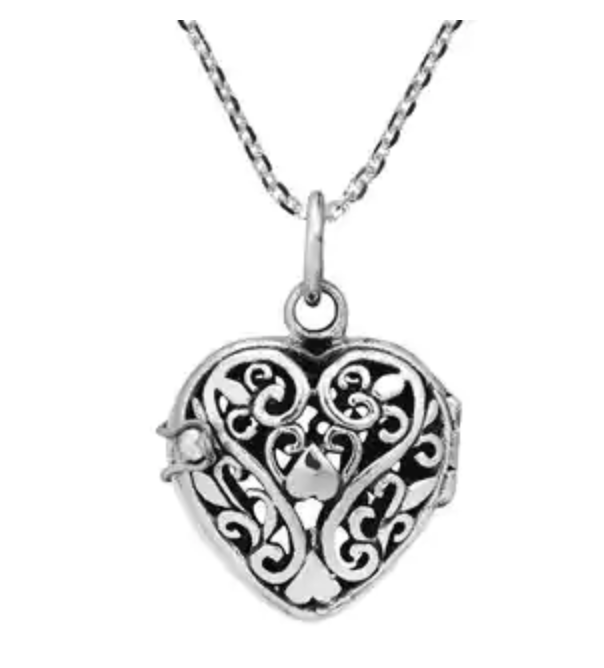 There is nothing more romantic than wearing a reminder of someone you love close to your heart. Lockets evolved from ancient amulets. European designs for lockets appear to date to the 16th century, when small pendants were worn to conceal good luck charms, small fabric squares soaked in perfume to ward off the poor smells on public thoroughfares, painted portraits, and even, on occasion, poison. 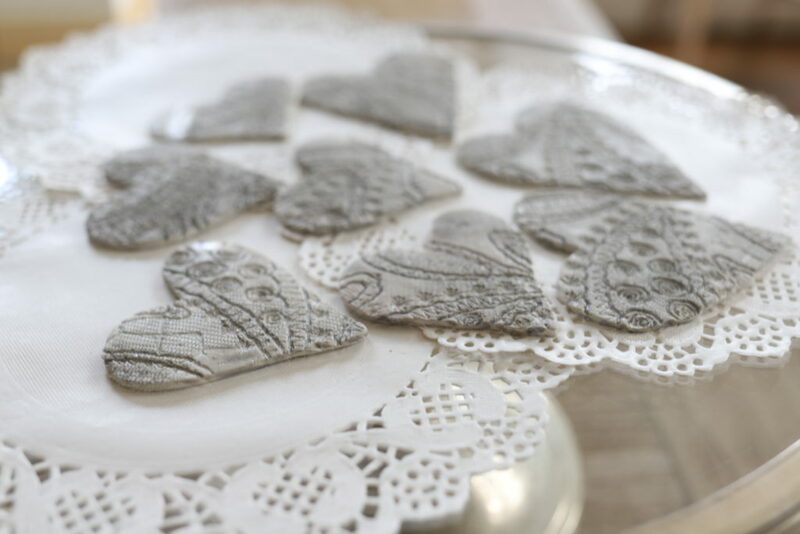 I came up with the idea to make a clay heart with a similar impression to the traditional silver lockets. I think they look similar! 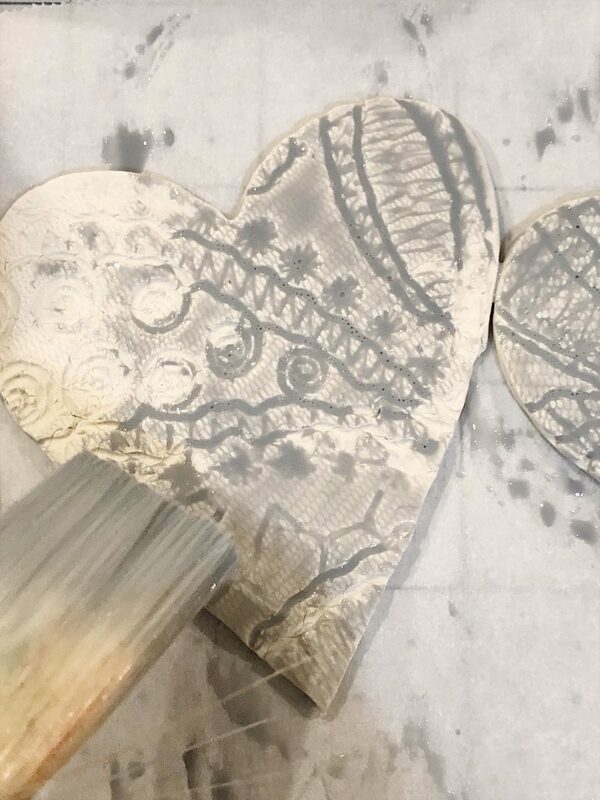 Break off a piece of clay and work it through your fingers to soften. Roll about 1/4″ thick with a rolling pin. 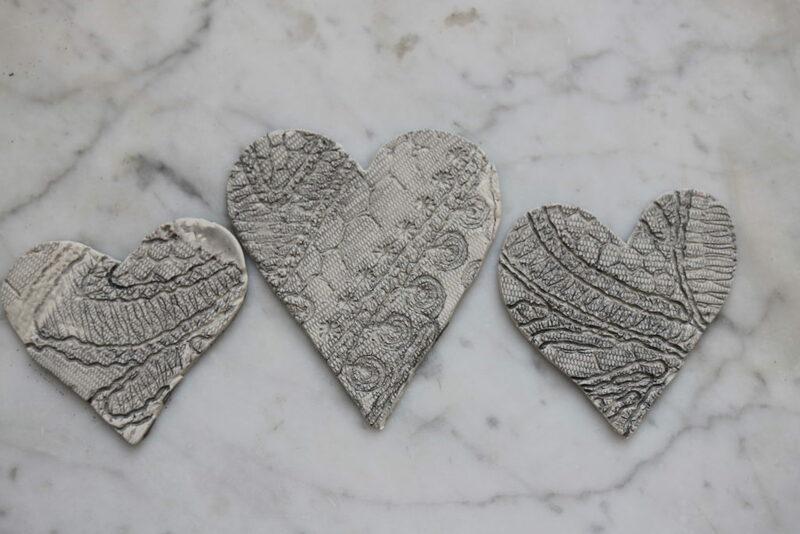 Cut out shapes with heart-shaped cookie cutters. 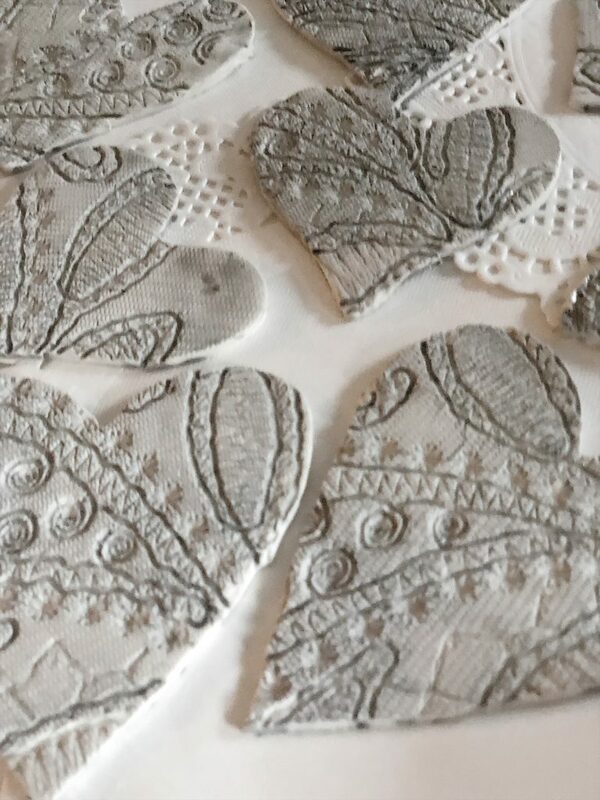 Select an area of the lace and press down on the clay. Use the rolling pin to enhance the indentation. 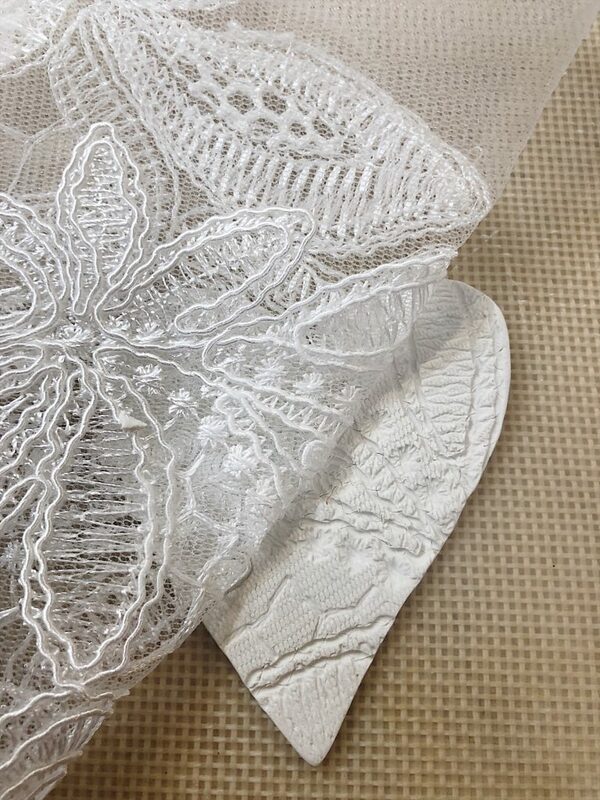 Carefully pull off the lace. 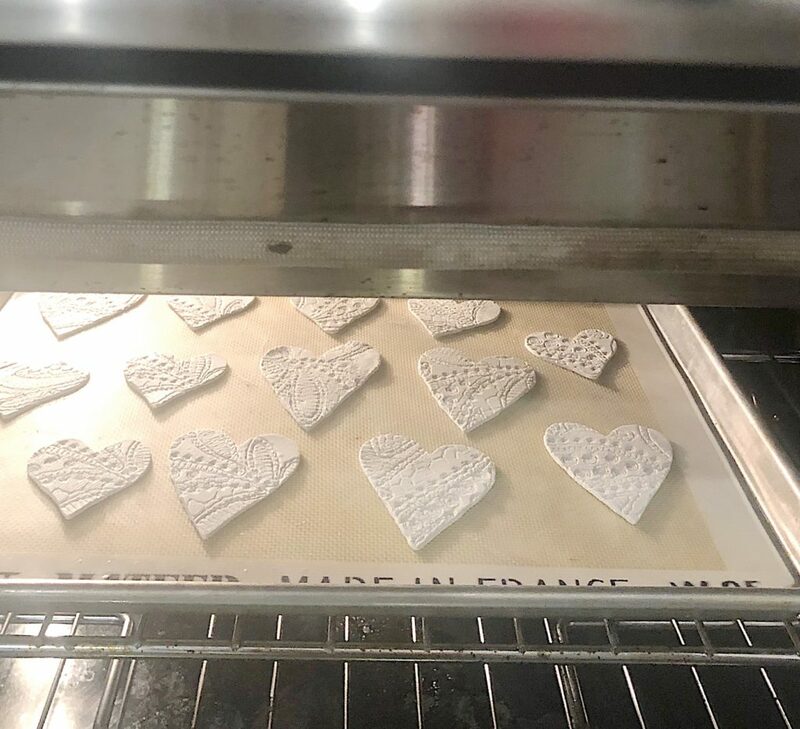 Place each clay heart on a lined cookie sheet. Bake according to directions, approximately 15 minutes. I absolutely love how they came out! 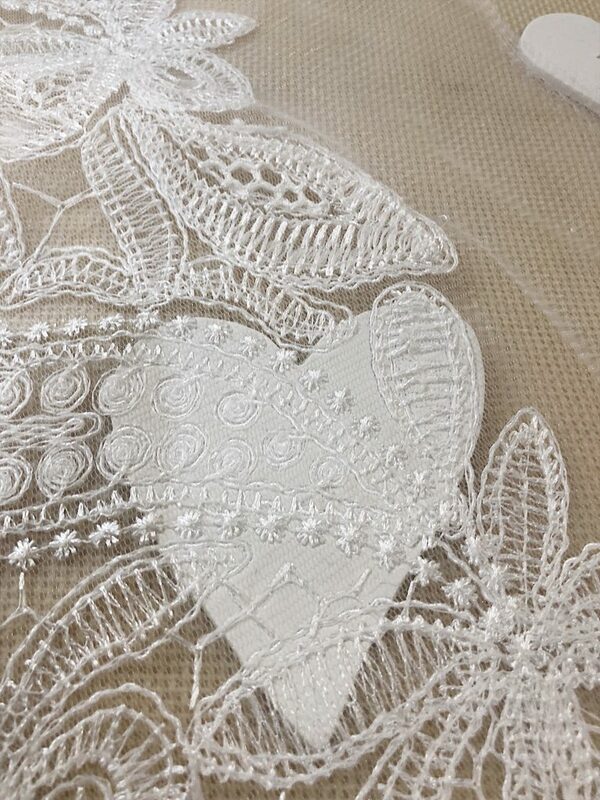 The indentation left from the lace reminds me so much of a vintage locket. 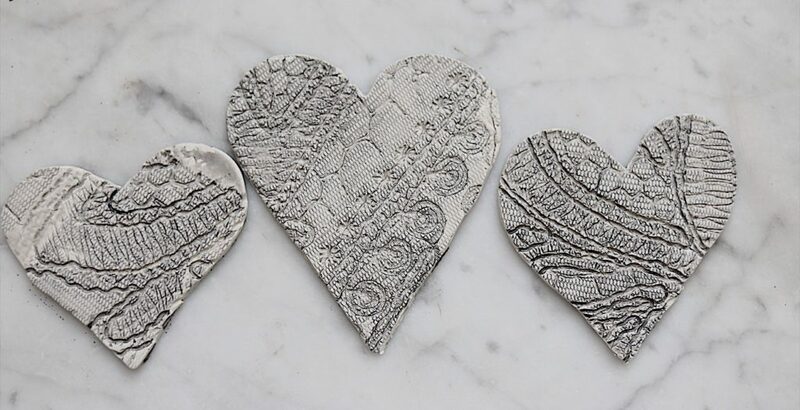 Shake the metallic acrylic paint and then apply with a paint brush. 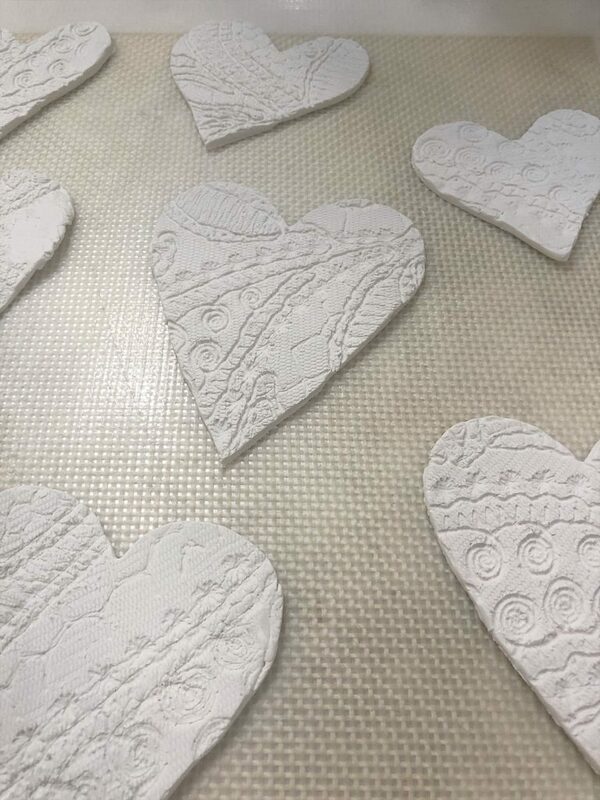 Let cool and us to decorate your home for Valentine’s day! I am so thrilled how these turned out. I just love them. I painted both sides of the hearts but I don’t think you even need to do that. 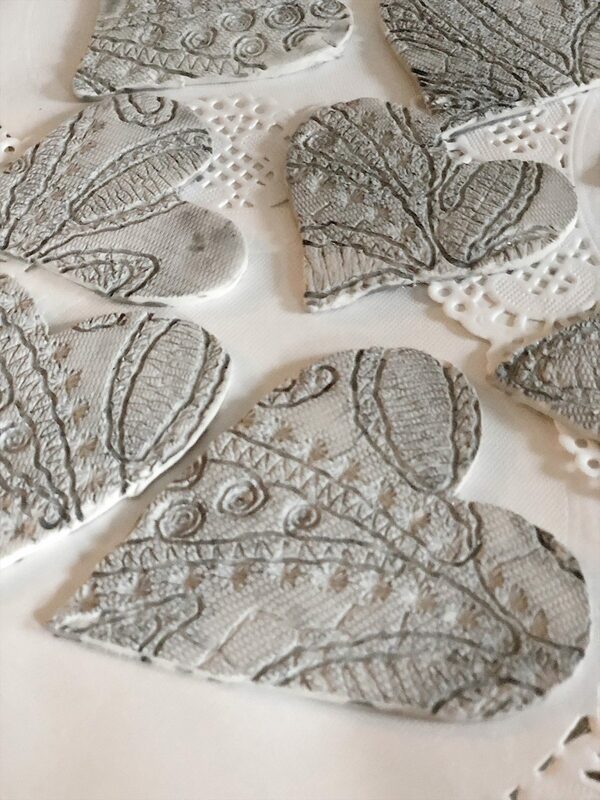 I hope you will try making these for a Valentine Craft. They are so easy and fun to make. I love this idea, thanks for sharing. Great! I will be writing a blog post all about it this weekend! 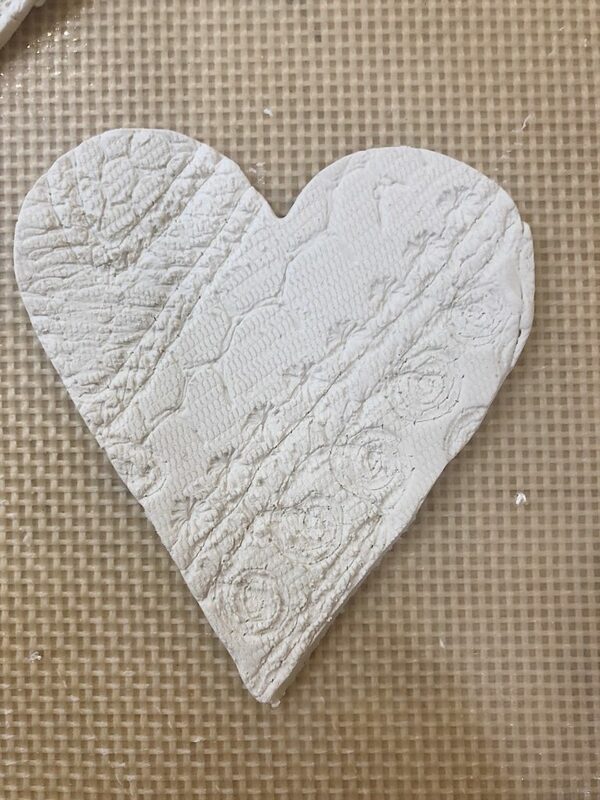 I love the clay heart craft, and I love the look of your blog. I have one favor to ask. Is it possible for you to increase the font size, please? I don’t know if I can do that. I think you can adjust it on your computer. What kind of computer so you have? 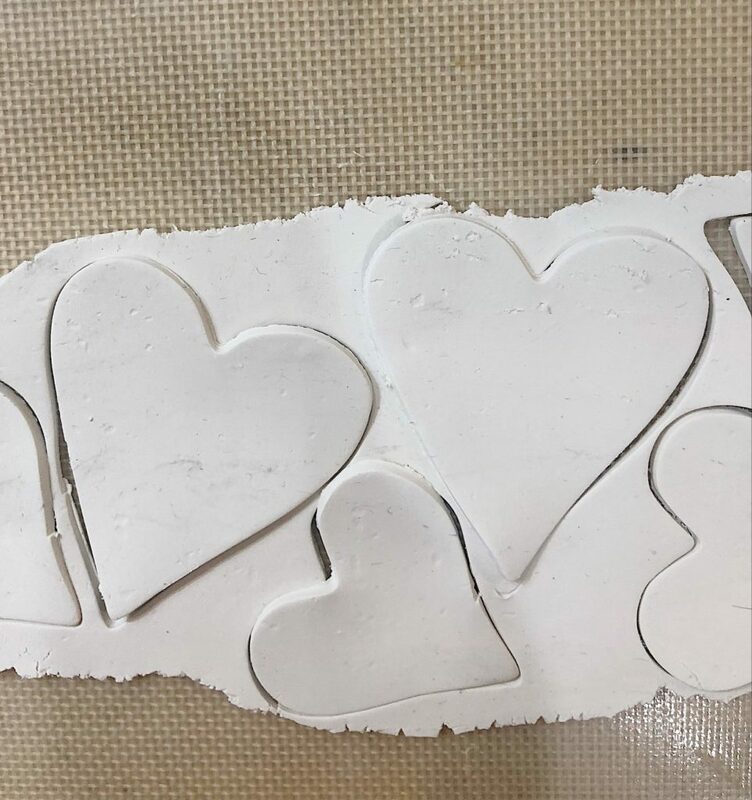 I went to Hobby Lobby today to get my supplies for the clay hearts. My grandchildren and I will be making them tomorrow. So excited! !